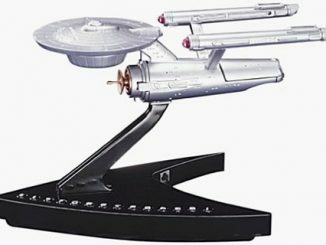 If the Star Trek Enterprise Telephone and a Star Trek Air Horn isn’t enough to get your messages across the Trekkie way, this Enterprise web camera might be just the ticket. 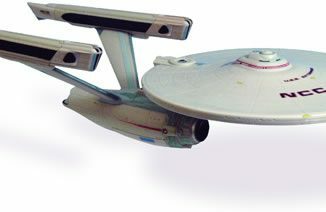 A new little item has arrived for those trekkies who won’t say no just because they already have a Star Trek Communicator Replica and a Star Trek USB Communicator Internet Phone laying around. 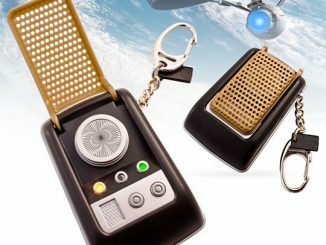 Say hello to the new Star Trek communicator keychain with sound effects. 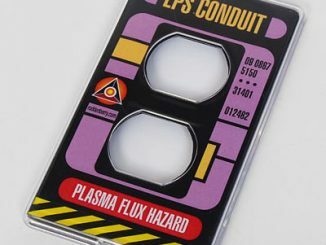 For those of you who have the Enterprise NX-01 Chandelier hanging from the ceiling, or loves to crack nuts with Spock and Kirk, here are a couple of “Star Trek: The Next Generation” inspired light switch plates that should be right up your alley. 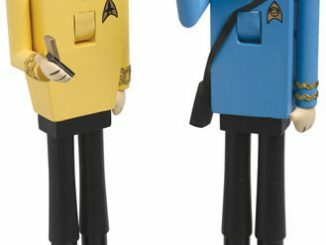 Here’s a fun and geeky complement to the Star Trek Enterprise Bottle Opener we covered a few months ago; a pair of nutcrackers shaped like Spock and Kirk. 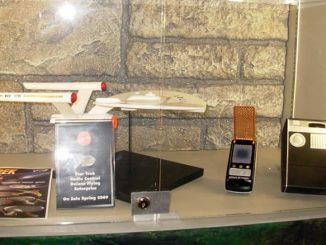 Remember the Star Trek Tricorder Replica? Soon you’ll also be able to get your hands on this authentic Medical Tricorder replica, the device used by doctors to help diagnose diseases and collect bodily information about a patient. We have seen the design of this classic spaceship as a source of inspiration for a chandelier, a telephone and a putter. Soon you will also be able to get the U.S.S. 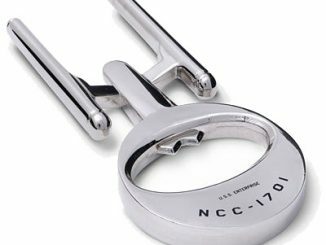 Enterprise NCC-1701 as a cool looking bottle opener. Fans of the Star Trek sci-fi series will soon be able to get their hands on this cool collectible Tricorder, the handheld device used for scanning an area. Ok, the Star Trek Enterprise Telephone will let you communicate for real, but who cares about such trivialities when you can get a communicator like this. When a package with a content like this arrives at the GeekAlerts office, as it did the other day, you truly feel that you can live up to the name of your blog. 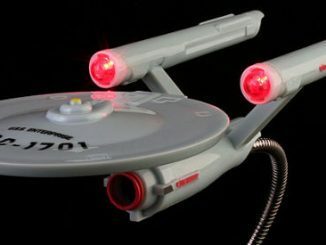 A Start Trek chandelier hanging from the ceiling and the Enterprise telephone on your desk, but still having a hard time getting your Trekkie message across? No problem, the solution is out there. After having been used as both a chandelier and a telephone, it is now time to let the classic spaceship show the world that it can be of good use to those who play golf – just as Star Wars showed us not long ago. Trekkie or not, this chandelier will probably turn some heads, no matter what. Poor Spock experiences a transporter malfunction. The cool Illogical Incident t-shirt design idea is created by Glennz. Cast your vote for it at Threadless. Thanks John!